A Spanish study has cast a spotlight on the rarity among horses of chimerism, in which an individual carries two distinct genetic make-ups. The research, carried out at the universities of Seville and Cordoba, focused on the recent breeding of purebred Spanish horses, the Pura Raza Español (PRE) breed. The study team found that sexual chimerism in PREs is not linked to infertility, despite the unusual genetic configuration involved. It is known that chromosomal anomalies are one of the principle genetic causes of infertility in horses. However, a great proportion of these cases still go undiagnosed, probably because the signs are non-specific and diagnosis is complex. 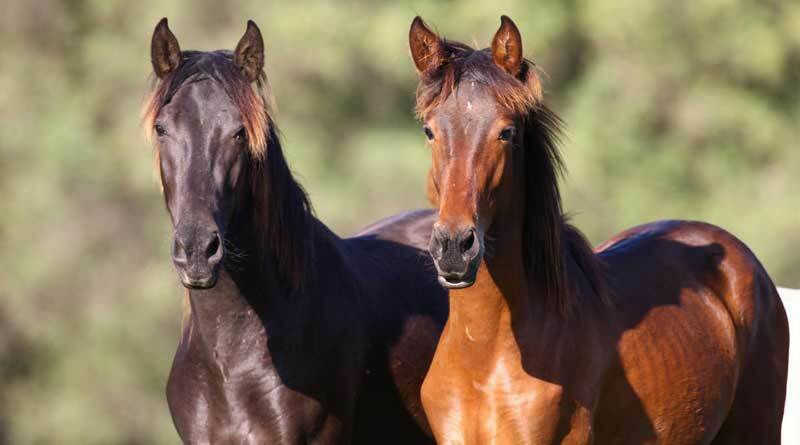 According to the study team, this is the case with chimerism, which is strongly linked with twin births in domestic animals, and whose prevalence and reproductive effects are still unknown in horses. Chimerism is a genetic disorder in which two zygotes (fertilised eggs) combine after fertilisation to form one single zygote that develops normally. The resulting individual therefore has two types of different cells, each with a different genetic constitution. In most documented cases, the cells of different organs or different parts of the body have different DNA, as if two beings were present in one body. In general, this arises either by the exchange of hematopoietic stem cells via placental circulation between dizygotic twins (blood chimerism) or by the fusion of two embryos in the first stages of development (true chimerism). In this context, the researchers published the first study to find the prevalence of twin births and chimerism in a large population of PRE horses. Their work also proved the effectiveness of a molecular detection tool prepared by the research team to detect chimerism. Foaling records from more than 21,097 PRE horses born in 2015–2016 were analysed. A total of 14 twin births, giving rise to 23 live twins, were noted, and analysis revealed five cases of blood chimerism among them. The overall prevalence of twin foaling was 0.066%, with 21.7% of these twins found to be blood chimeric cases, for an overall prevalence of just 0.011%. This suggested the genetic condition was extremely rare in horses. “Furthermore, no true chimaeras were detected,” the study team reported in a short communication in The Veterinary Journal. Mercedes Valera, professor of the Higher Technical School of Agricultural Engineering at the University of Seville, said the chimeric detection tool used for the study was fast and cheap and could be incorporated into the veterinary care of horses, as it allowed for the detection of chromosomal anomalies connected with infertility and subfertility. The research was carried out in collaboration with the Veterinary Genetic Diagnosis Laboratory and the Animal Cytogenetic Laboratory at the Department of Genetics at the University of Córdoba and with the Ing. Fernando N. Dulout Veterinary Genetic Institute of the Faculty of veterinary Science at the National University of La Plata in Argentina.